Women's Original Rib Cuff Tall Boot Socks is rated 3.3 out of 5 by 3. Crafted from a wool and cashmere blend, this quality boot sock will keep feet cosy in colder temperatures. Designed to be worn with the Original Tall Boots, the sock features a knitted ribbed cuff and PVC logo branding. Rated 5 out of 5 by Caseym from So cute and warm I bought these and was worried they wouldn’t be warm because the liner isn’t fleece but they are still very warm!!! I got a Large and my boots are a size 8 and they fit well my feet aren’t crammed! Rated 2 out of 5 by kensie from CUTE BUT HANG LOOSE OVER BOOT GOOD COLOR AND CUTE BOOT SOCKS, BUT THEY HANG VERY LOOSE OVER THE BOOTS. I WISH THEY WERE TIGHTER AND STAYED IN PLACE BETTER. Rated 3 out of 5 by Jackgrace2 from Stretches out too easily I bought these socks this past weekend and loved the texture, softness and design. 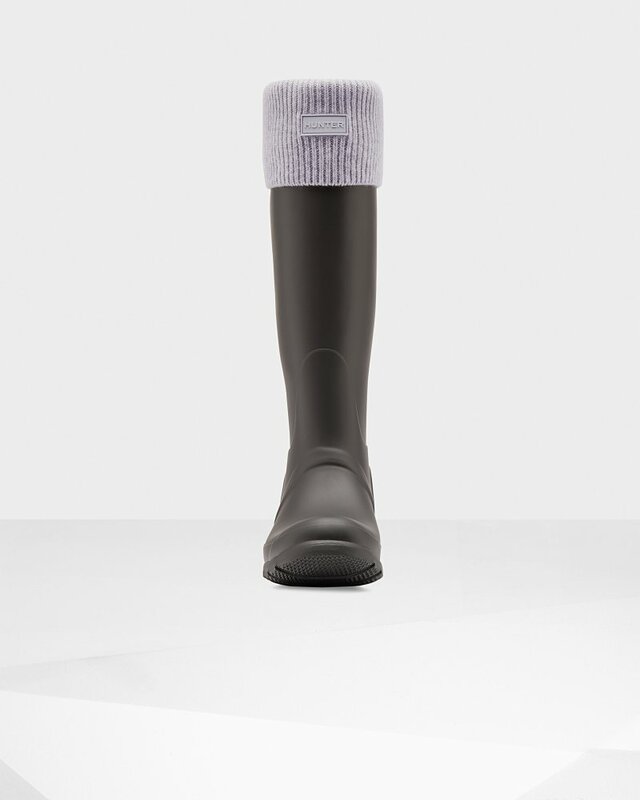 Especially the way the hunter logo looks (Indiscreet) However; purchased the medium for my size 8 hunter tall boots and they look very stretched out already. Not a tight fit when you cuff over the boot like it looks in picture. Just something to be aware of.